When you hear the phrase “barn find” you think antique car, old muscle car or a vintage race car. Well, this is very similar, and it has to do with a vintage race car. When I retired one of my projects was to clean and organize the attic. I have gotten to the point that I am going through old photos. In my search, I found a treasure: 6 original photos of the 1966 Le Mans winning Ford GT40 Mark II. I had heard stories that car companies would go around the country displaying an award-winning race car. Apparently, it is true. In 1967 Ford displayed the GT40 Mark II at Wilson Ford in Corvallis, Oregon. In 1980 I was working in the parts department of a dealership in Corvallis. One of the salesmen, knowing I like race cars, gave me some photos. The photos were originally taken with a Kodak Instamatic camera and the date, 1967, was hand written on the back. The photos show the car being delivered to Wilson’s Ford on an open flatbed trailer that was being towed by a ‘67 Ford Ranchero. The photos in the showroom show how small the GT40 is, and how low it is compared to a ‘67 Ford Galaxy and a ‘67 Ford Falcon. I had heard stories that car companies would go around the country displaying an award-winning race car. Apparently, it is true. In 1967 Ford displayed the GT40 Mark II at Wilson Ford in Corvallis, Oregon. It’s funny that the flatbed trailer the GT40 Mark II was delivered in was so different from the modern transporters. Nowadays you see a Semi truck and trailer with room enough for up to 3 race cars. These transporters may have engine shop, machine shop, fabricating shop, or even a place to sit back and relax. Back in ‘67 I would love to have seen this great race car, one of my favorites. In 1966 the Ford Motor Co. entered 8 cars in the 24-hour race at Le Mans. Five other GT40s were entered by privateers. 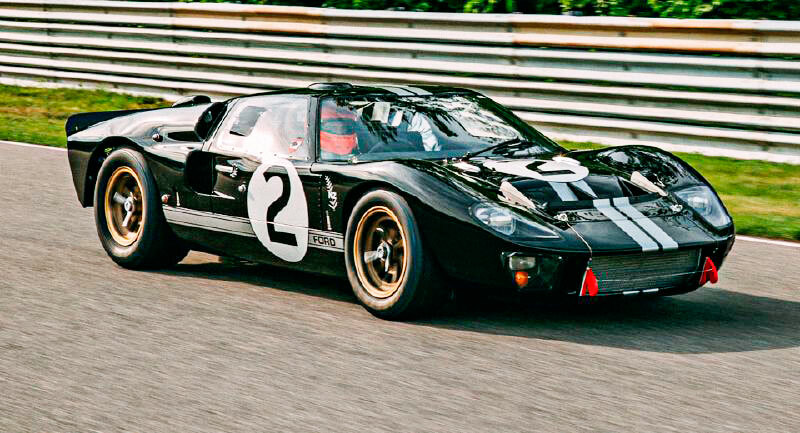 Ford swept the top three places with the GT40 Mark II serial number P/1046 came up the winner. After a complete restoration, in 2014 it was reported that the Ford GT40 Mark II serial number P/1046 was sold for $22 million dollars. Since I can’t afford the real car the photos are the next best, found treasure. 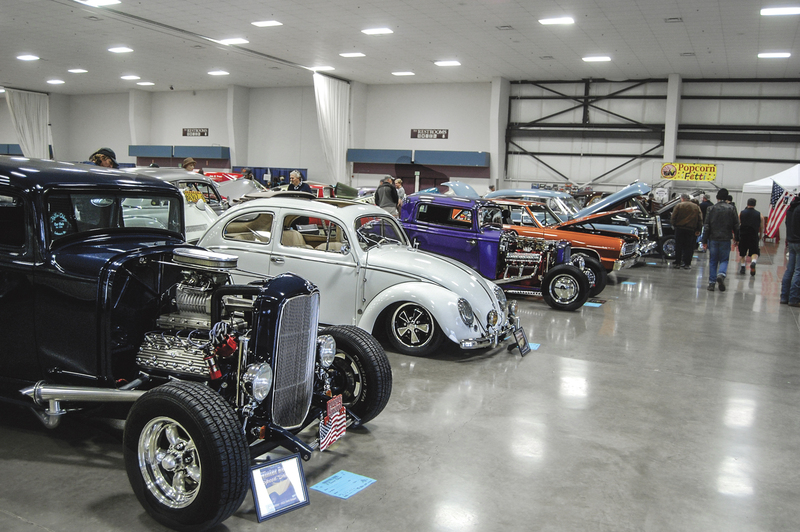 A mild winter here in Albany, but a highlight of the winter is the Winter Rod and Speed Show at the Linn County Fairgrounds. 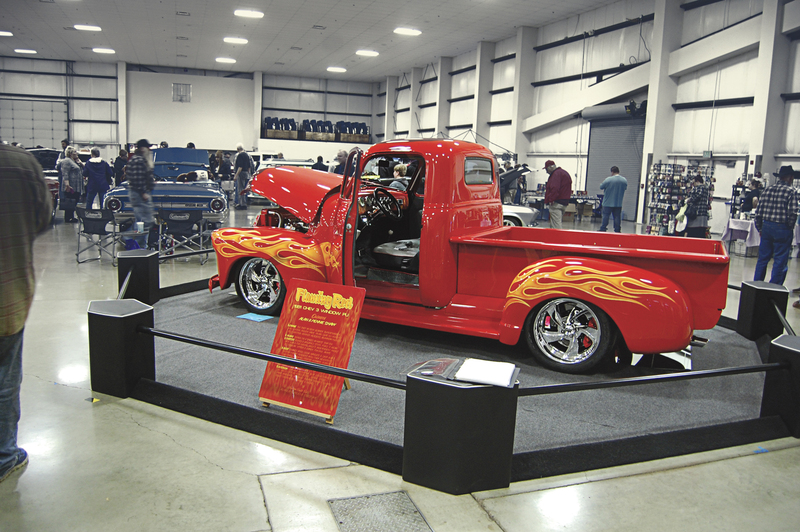 This year’s show was an exceptional show with a great selection of cars, trucks, racing vehicles there. Not only was there a unique variety of vehicles , but a unique variety of vendors as well. Vendors selling their wares, such as die-cast models, tee shirts, metal signs, and leaf gutter covers—more to come on that later. Now on to the show! 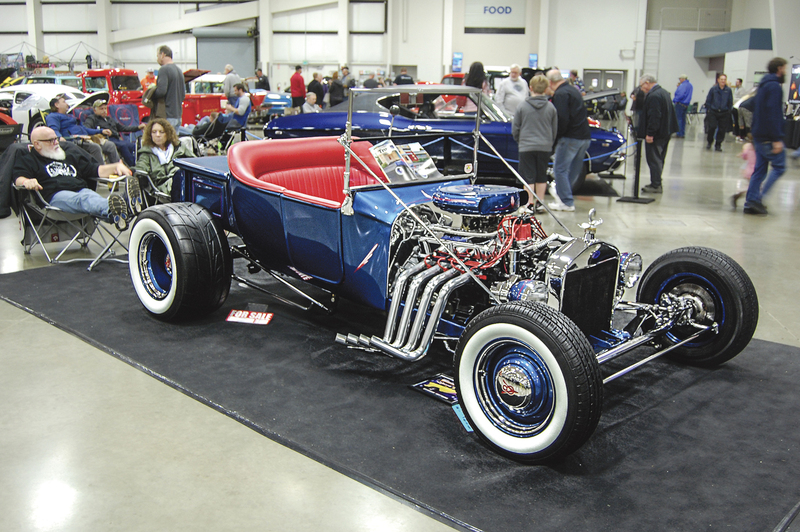 There was a mixture of vehicles such as a traditional classic beautiful blue T-Bucket and an Indy car, a 1986 March Indy car powered by a fuel injected small block Chevy engine, driven by sprint car champion Sammy Swindell. If you like sports car there was an original 1953 MG and a replica of a 1958 Ferrari 250 Testa Rosa. In the same building was a very unique truck. Some would call it a rat rod. I call it a work of art. It’s a ‘32 Dodge cab modified, on a semi truck chassis. The suspension is air operated with a combo compressor and air tank behind the cab. The rear axle has a set of duelies for tires and air bags to raise and lower the rear end. The front suspension is a straight front axle with custom fabricated cantilever rockers with air shocks. It came out of the Nasty Works Shop in Eugene. It is an engineering marvel. Back to the vendors. If you were hungry there was popcorn, candy, beef jerky, ice cream, and nuts being sold by vendors. Also the best barbecue sauce I have ever tasted- the award winning “Best Damn bbq Sauce” out of Salem. Back to the show. Every vehicle there was beautiful. A car that I had never seen before, a white ‘67 vw bug that was chopped, had an extended front suspension, no front fenders and very loud straight pipes coming from a heavily modified engine. 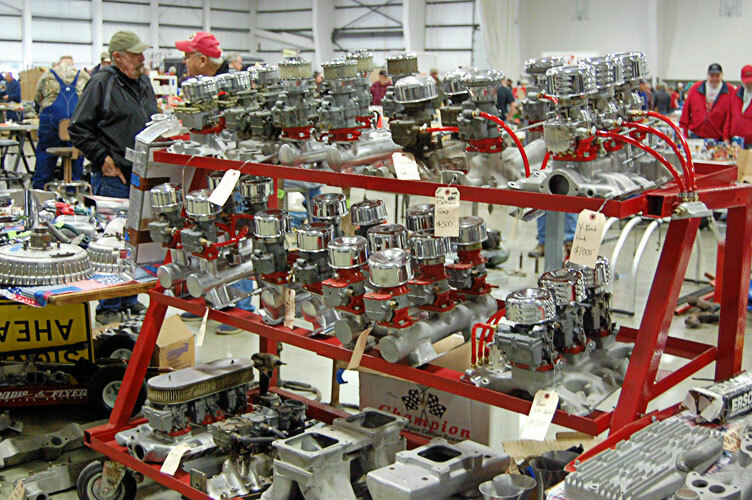 This was along with your rail dragsters, drag alters, classic cars and trucks. As you walk around the perimeter of the building, more vendors. 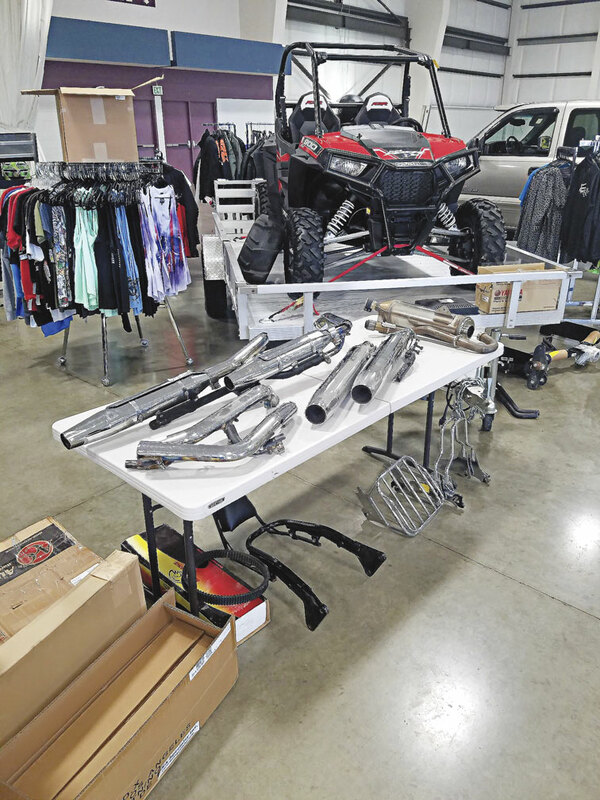 Plastic models, paint and upholstery, different types of raffles, custom posters, custom drawings, key chains, scenty air fresheners, windows for your home and the new shop you are building were there for you to purchase. For the daring there was a nascar race car simulator where you can sit in a nascar race car and run a virtual race. Speaking of works of art, Loren Kuipers from Scio brought his ‘65 Chevy pickup. It is pearl white and has blue trim with what looks like raindrops that he painted himself. Also at the show was drag racer, artist, and author Kenny Youngblood. Local author Jim Lindsey, with 2 books about growing up in the time of early hot rodding. So, next winter, usually around mid-January, if you want to add some spice to your life come to the Winter Rod and Speed Show in Albany. It was a perfect day for a swap meet. The sun was shining it was not too cold and I didn’t have that much to sell. The swap meet in Albany is huge, four large buildings and a lot of spaces outside with your typical things to buy like tires, carbs, diecast cars, tools, project cars, turn key cars, neon signs, and even old Levi jeans. This is what I noticed while walking around the meet. I would overhear people talking. The most common phrase heard was, “I used to have one of those!” when talking to friends or just listening to people I know. Here are a few stories I heard. Inside one of the building was a selection of carbs. Three guys were discussing the virtues of how many carbs do you put on an engine: one 4 barrel carb, two 4-barrel carbs, three 2-barrel carbs and so on and so on. Listening, I know its called eavesdropping, but not if you’re with friends. I think this was one of the best stories. As we stood around looking at a ‘65 Mustang we heard the story that went like this. A dad just bought a ‘65 Mustang that had been sitting for a while. He brought it home, it was a runner. As the dad was washing it and cleaning the interior his wife came out to see his new toy. All shiny and clean, this mustang was purple in color and had black interior with a V8 engine and an automatic transmission. Just then his 16 year old daughter showed up. “It’s beautiful,” she exclaimed. Looking the car over she asked, “can I drive it ?“ Mom said, “I’m sure Dad will let you drive it”. Well, to a 16 year old girl that means ”It’s mine”. After that the dad only got to drive it after he did some repairs or tune ups and oil changes. Most of the time it was rescuing her when she ran out of gas. One of my stories is how I learned how to drive my dad’s ‘51 GMC pickup with a 3 speed on the steering column. Our family had 3 acres in southern Oregon. I was bucking hay with a couple of friends and I was driving. Now, still learning how to use the clutch, I let it out too fast and, as you could imagine, we lost about half the bales off the back of the truck. We had to do all that work over again. My friends were not happy with me. So, next time you go to a swap meet or car show stop and listen. You may hear some great stories. That is, if you haven’t heard them before. The other day I had the privilege of having lunch with a true hot rodder, Jim Lindsay. Jim has written two books: The Little Bastards and Swerve, book two of The Little Bastards series. Jim had a vision about writing a novel, backed by real life experiences about the hot rodding. The Little Bastards is a story about car kid in a small town in Oregon, growing up from pedaling bikes to racing hot rods, all in the decade of the fifties. As a car guy I know what is was like back then- tee shirts, blue jeans, flat top haircuts with butch wax . Jim has lived this life style as a true car guy. His dad had a fear for his boy, then in high school, unleashed, would become a hoodlum. So Jim hid his early cars in town behind a friend’s house. 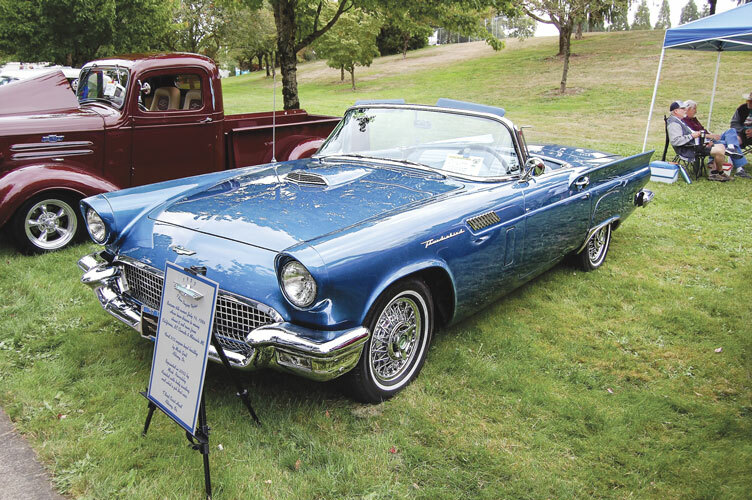 The first was a ‘47 Ford coupe and later a 1954 F100. His first car, he could park at home was a 289 powered Mustang, lowered and used hard. Now this will make all you car guys cry. The price of gas back then (back in the mid ‘60’s) was about 28 cents a gallon. Food was priced similarly. Back then, in Albany, the place to stop for a snack, was Red’s Drive-In where you could get a burger, fries and a drink for about $0.50. Or, if you were a little short on money because you spent it all on gas, you could get hash browns and gravy for $0.25. Red’s Drive-In later became the T&M and then Westy’s. This description was true in Southern Oregon where I grew up and spent most of my hard earned money on gas. I could cruise all night long. I think that was true no matter where you lived. 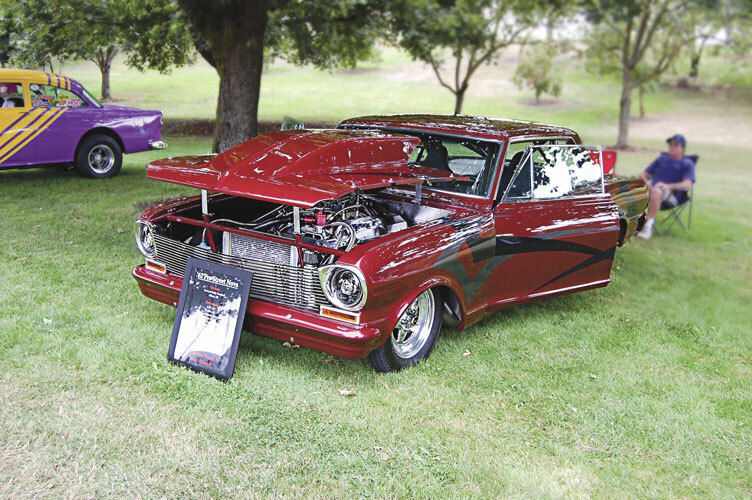 Jim’s passion for cars was fueled by witnessing kids of the 50s, with Elvis style hair, driving chopped down Fords with spinners and loud pipes. He was impressionable, being pre-teen, when these creatures wearing bomber jackets owned the streets with their girlfriends wearing lipstick and winks. Now, I have read The Little Bastards and I loved it. I can relate to getting a car, fixing it, cruising with the friends you make and the fun you have. Talking to Jim, we discussed the trend of cars. In the ‘40’s and ‘50’s if you wanted a hot rod you had to either build one or buy one. Then came the factory cars and the world changed when the Beatles got off the plane. This was about the same time when old time rock and roll faded out and the trend of muscle cars started. Now you could go down to the dealer and get a Chevy, Ford or a Dodge already souped up and with a 4 speed. As Jim said “ the days of having to build a hot rod are over”. Today you can build a hot rod or buy a hot rod of your choice. There are also vintage muscle cars, modern muscle cars, kit cars or just take a car of your liking and fix it up the way you want. The possibilities are endless. 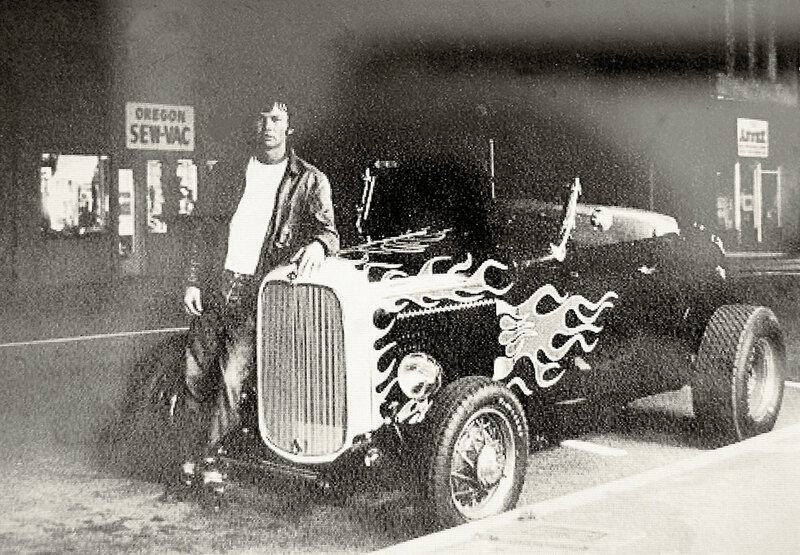 Jim has built and raced multiple types of cars beginning with a deuce roadster in the early ‘70s. He drove all over, even to Bonneville. Speaking of Bonneville, Jim is the proud owner of the “Red Hat.” A baseball cap is the badge worn by life members of the Bonneville 200 mph club- a prestigious group of about 600 men and women who have set a record at a SCTA sanctioned event at over 200 mph. 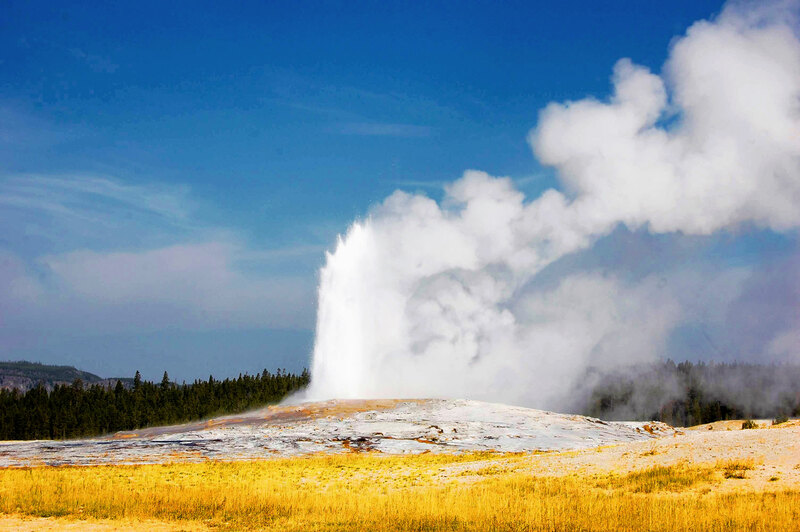 Jim set a record with the average speed of 218 mph last year. The racecar is a rear engine modified roadster built with the help of Marty Strode, a metal wizard from the Portland area. The roadster is powered by a blown ‘50 Mercury engine equipped with Ardun heads. A mostly home built race car is his bright yellow ‘23 Ford roadster with an alcohol injected 341 DeSoto Hemi engine. 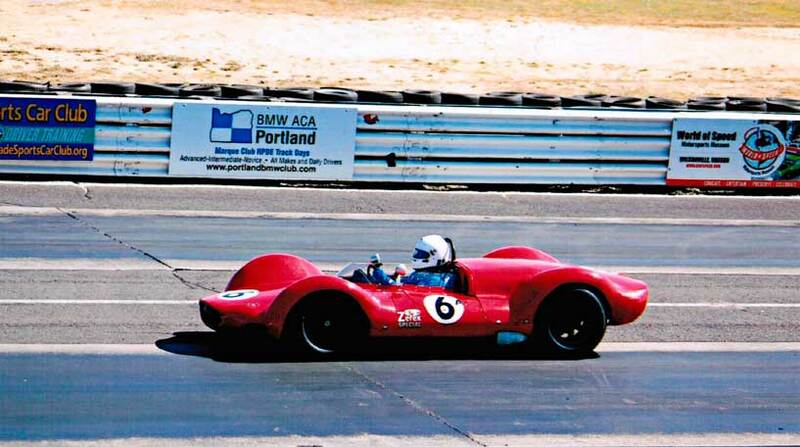 Jim raced the Nostalgic Circuit at dragstrips up and down the west coast. In 2006 he became track champion at the Woodburn dragstrip. 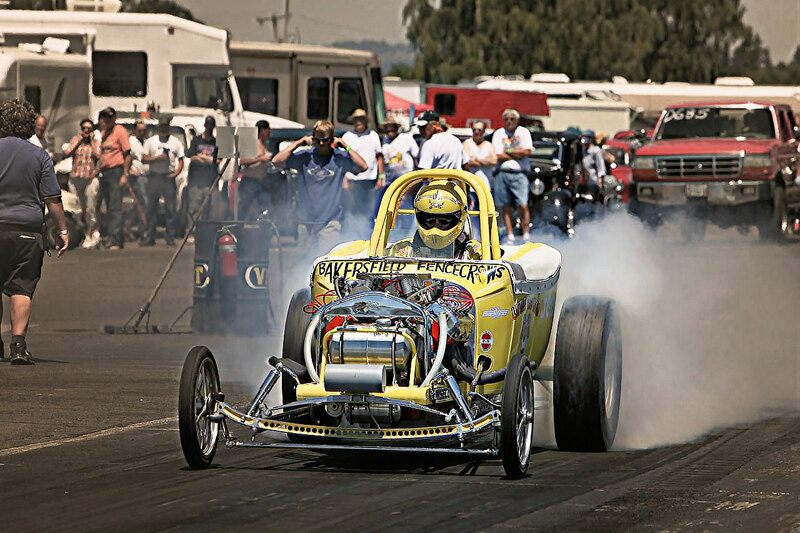 As a young man, Jim saw Bob Duedall’s competition coupe dragster around town in Albany. Fifty years later he became owner of the car that he had worshipped as a young man. 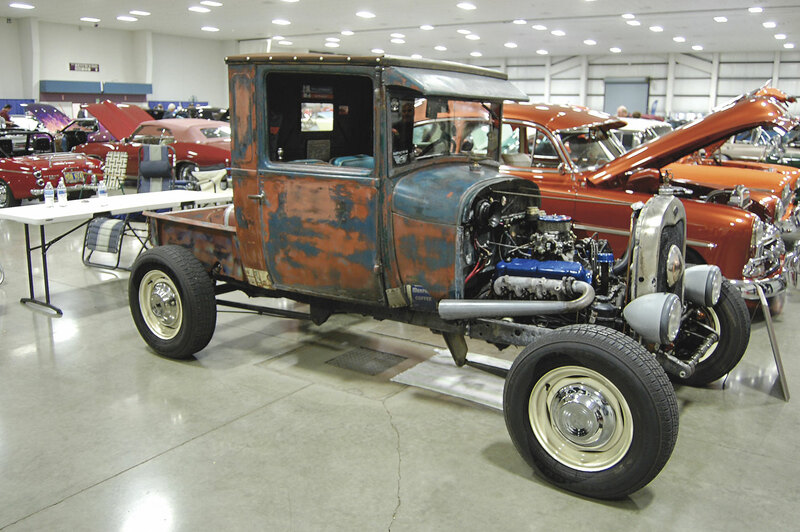 Once restored the Bob Duedall T-bodied comp coupe was on the prowl again. 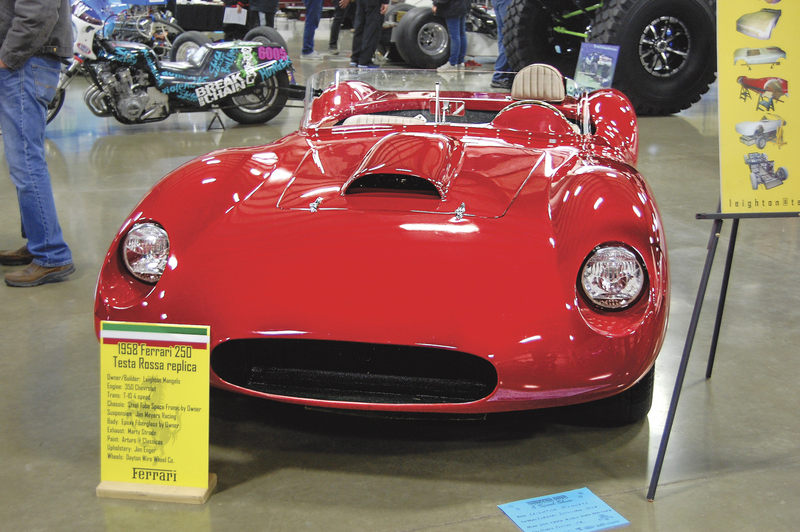 It was taken to the 2013 Grand National Roadster Show in Pomona, California, where it won best dragster. 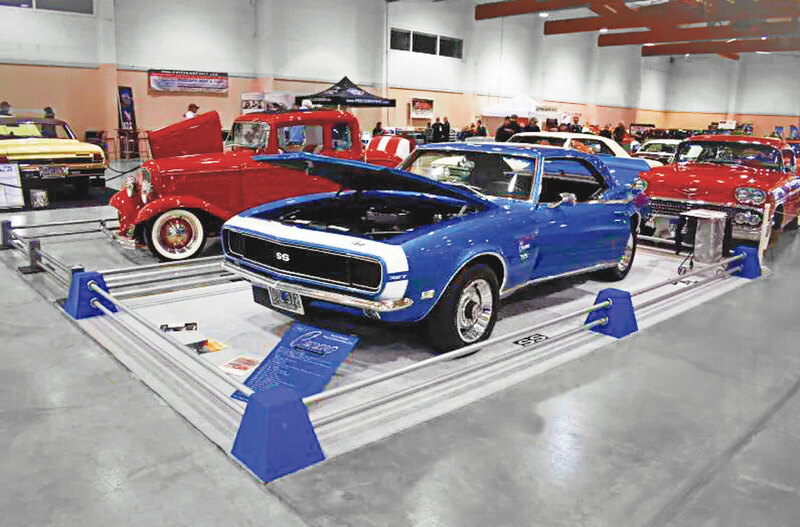 The car was then displayed for a year at the World of Speed Museum in Wilsonville. So lately after reading The Little Bastards, it reminded me of a cross between the movies American Graffiti and Stand By Me. 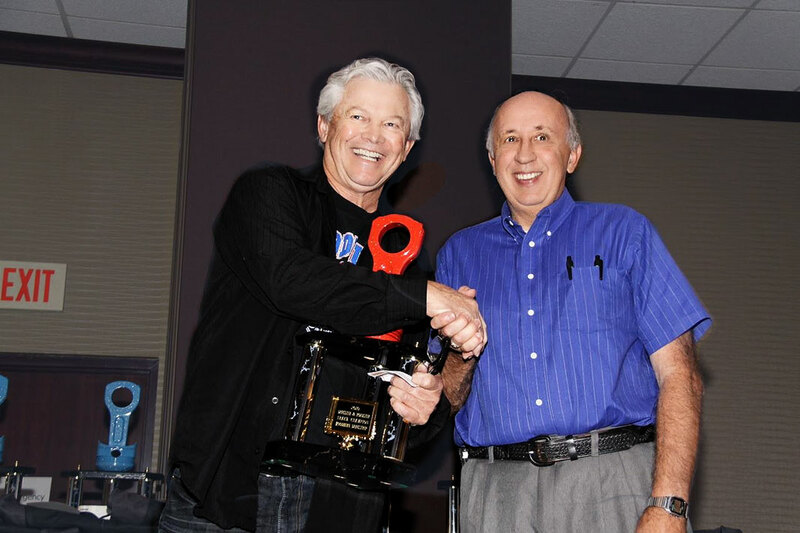 Jim hit it right on the nose with his hot rodding knowledge and racing experience. I just started reading Swerve and it is just as great as The Little Bastards. I highly recommend both novels for any car guy. Both books are available on Amazon or for signed copies send $20.00 for Swerve and $15.00 for Little Bastards or $35.00 for both to Stamper Press, 34339 Colorado Lake Dr., Corvallis, OR 97333. You’re going to love these stories. We all know that things change, sometimes good, sometimes not so good. This is very good. When was the last time you were able to go to three events all within walking distance? 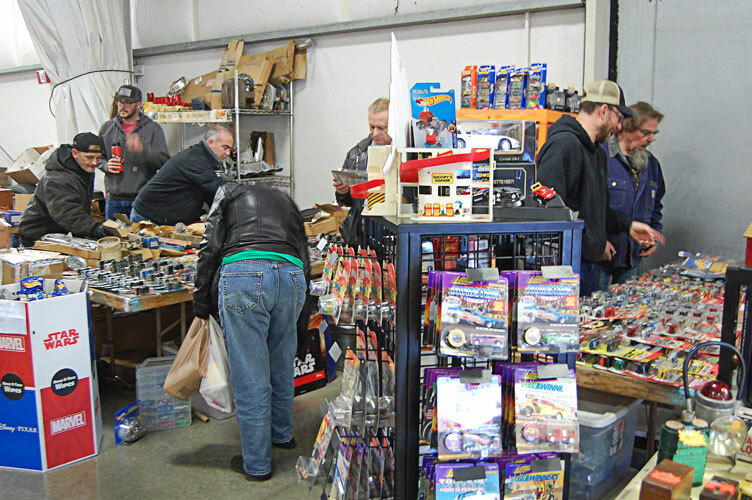 The Mild to Wild Swap Meet has always been held in Albany at the Linn Co. Fairgrounds. This is what has changed. 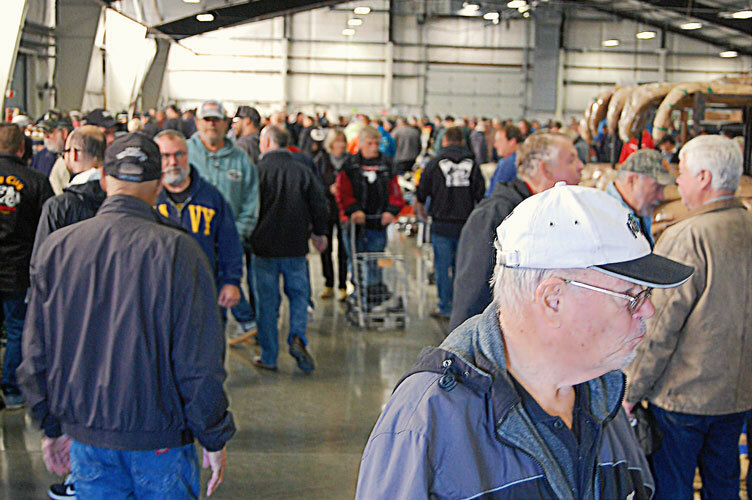 In February 2019, the swap meet will be at the Oregon State Fairgrounds in Salem. 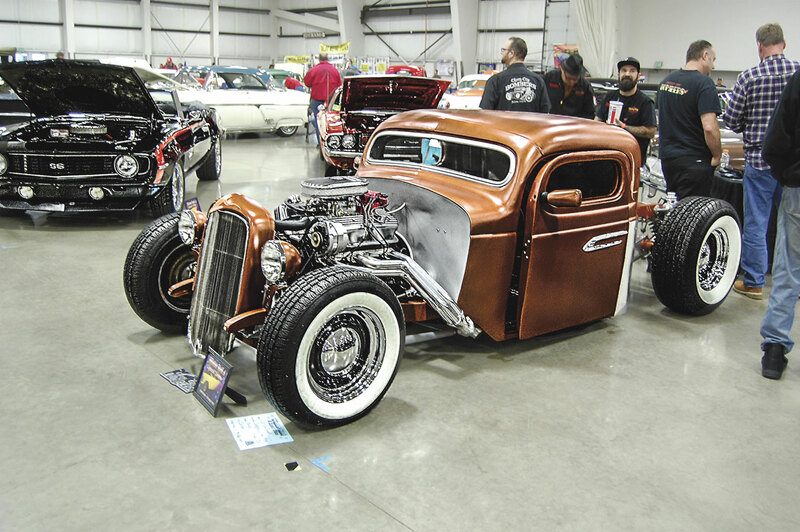 Now it will be held with two other events on the same day, the Salem Roadster Show and indoor dirt track racing. That makes it a 3 in 1 day. The new kid on the block, or rather, in the fairgrounds, is the swap meet. 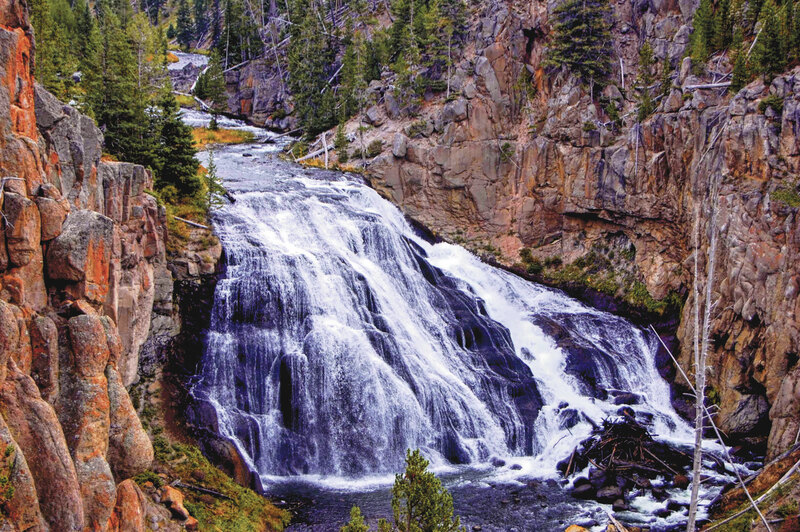 The Mild to Wild Swap Meet is in Columbia Hall and will be held on Saturday, February 16th from 9:00 am to 4:00 pm. Now if you want to get a booth to sell something contact Steve Moore at 541-990-8087. If you do get a booth set up is the day before, on Friday afternoon. 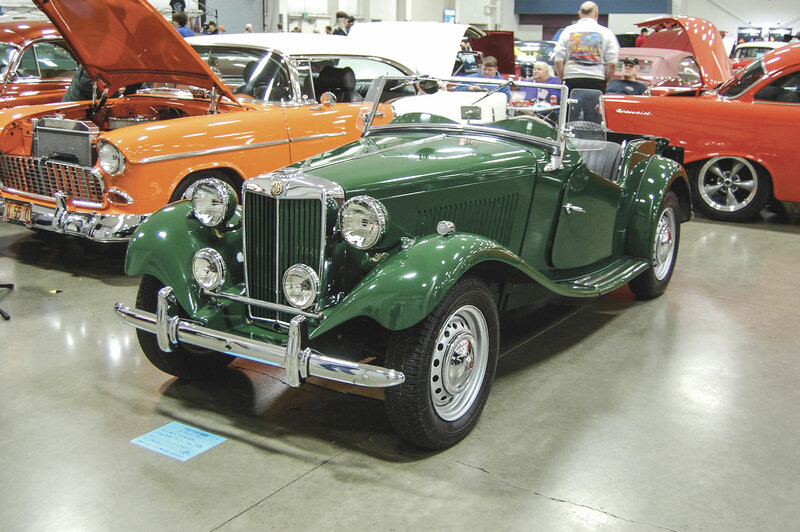 The Salem Roadster Show is in the Jackson Long Building on Saturday, February 16th from 9:00 am to 6:00 pm and Sunday, Feb 17th from 9:00 am to 5:00 pm. I have been to this show before and it is great. With a variety of cars and trucks, it has something for everyone. Last, but not least, is the indoor circle dirt track races. It will be at the Forster Livestock Pavilion the races go for two shows . The first one is from 9:00 am to approximately 3:00 pm. The second one is from 5:00 pm until they are finished. 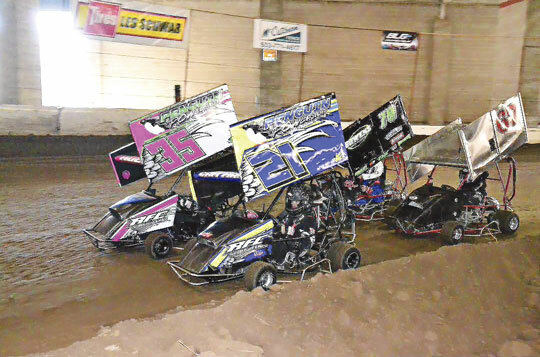 The classes are open comp cage karts, pee wee karts, micro-sprints, Pro 4 cars and dwarf cars. The racing is exciting, but the temperature usually is cold so bundle up. With 3 different events there is also three different admission fees. So, in the middle of winter on probably a rainy day you can get your car fix all indoors all day long. Don’t forget! 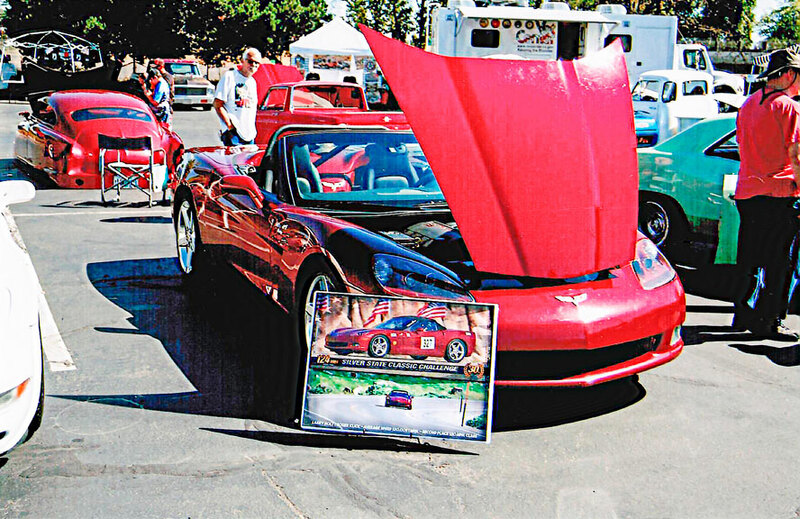 Saturday, February 16 there is three automotive events in one day at the State Fairgrounds. I am used to getting up a 0 dark hundred in the morning for a car show. This morning was a little different. The show was in my home town of Albany. The only reason I was up and out so early was to watch the balloons go up. Hot air balloons launch real early in the morning when the air is calm. The Art and Air Show Festival is a big weekend event here in Albany. 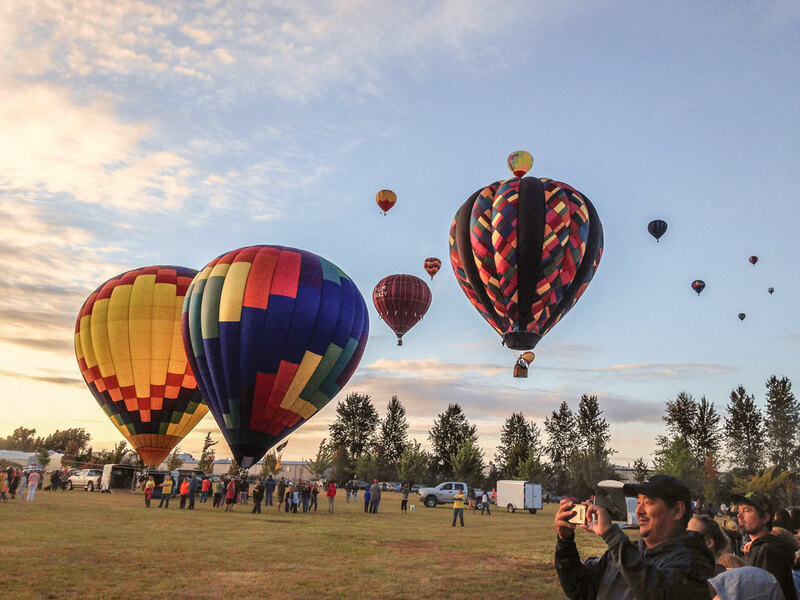 The festival consists of hot air balloons, craft booths with just about everything from photos, to art work, to paintings and much, much more. 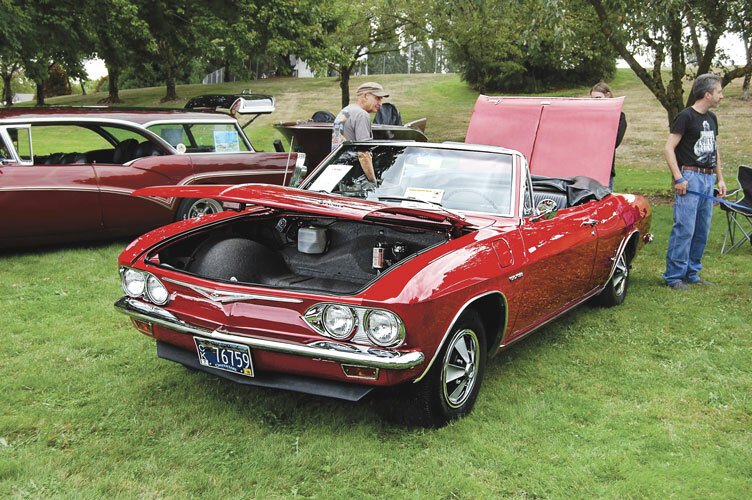 There is also food vendors, live music, fireworks, and last, but not least, a car show. My friends and I like to show up to the car show early. This way we can see the see and hear the other vehicles rumble in. In some cases you can hear a hot rod or race car come in before you even see them. One of those cars is a ‘62 Nova Pro Street drag car. Paul and Kathy Campbell of Albany owns this beast. It runs the quarter mile in the low 9.00 seconds. Part of the festival is events at the local airport which is right across I-5 from where the car show is. As we sit there, shooting the bull we can see all the different aircraft take off and land. 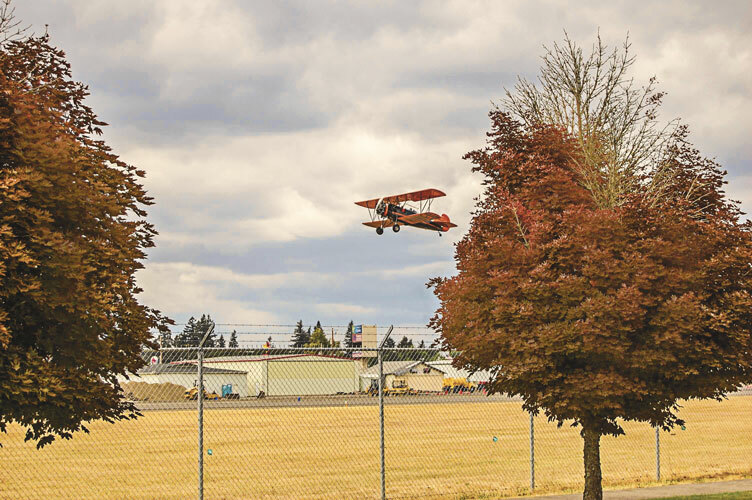 We can see everything from a biplane, ultralights, home built aircrafts, to watching a Lear jet take off. Ok, back to the cars show. Now I love any car with fuel injected velocity stacks, big wide tires and wings, like a Can Am race car. In my opinion wings should be on race cars only. I bring this up because of one car that has been around Albany for a while. Blaine Blood drives a ‘23 T bucket with big rear tires, side pipes and tall staggered velocity stacks feeding a small block Chevy. From a distance it looks great, up close you find the truth, The stacks are fake , they cover a 4 bbl carb. Don’t get me wrong, this car still looks and sounds so cool. On the other end of cool cars is a 1964 Amphicar. You know, one of those cars you can drive down the boat ramp at a lake and just keep on driving. The amphicar is owned and driven by Fred Calosso all the way from Florence, that is Florence, Oregon, not Florence, Italy. 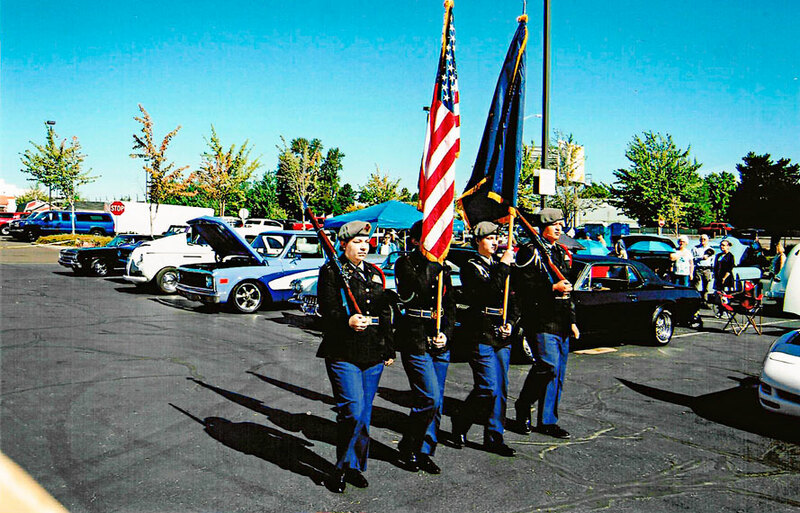 The car show is sponsored by Lassen Toyota and put on by the Willamette Chapter of Studebaker Drivers Club. So, next August, if you are in the Albany area stop by. Where else can you see a car show with a great variety of vehicles and an air show. Not to mention it is all free except for parking. That will cost you 5 dollars. There is something for everybody. If you come don’t forget to come early. The hot air balloons launch at 0 light hundred, at sunrise. I have been to and entered a lot of car shows over the years. I always ask where does the entry fee and all the proceeds go? Some of the answers I get are we have not determined yet, a charity, or a good cause. This show was for a great cause. Oregon Paralyzed Veterans of America, the Oregon chapter. From what I saw the veterans did a lot of the work. Everything from registration to coffee and doughnuts, to help parking the cars. One thing I really appreciated was the respect shown. When the Color Guard presented the flags and the national anthem began everyone stood at attention, removed their hats and showed their respect. It was really great. Now on with the show. You name it and it was there. 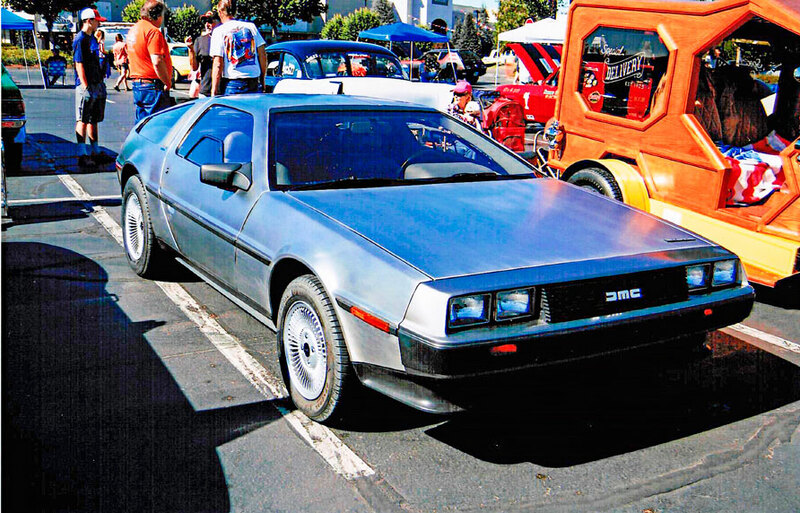 I have not seen a DeLorean in a long time. When I saw it I thought where do you get the fuel for the flux capacitor? Just a reference to the movie “Back to the Future.” When was the last time you saw a ‘67 Rambler American. It looked bone stock on the outside with a beautiful orange/gold paint job. But the killer is it has a 401 V8 engine with 2 Holley 4bbl carbs. There was a beautiful ‘84 Chevy Monte Carlo, custom paint, lots of chrome and hydraulic suspension. Three other cars that caught my eye were a Porsche, a Cadillac and a Corvette. The 1955 bright red Porsche 356 Speedster was flawless. Looked all original and I think it would be a kick in the rear to drive. Also in the line of vintage vehicles there was a 1951 Cadillac four door, all original, grey in color with a back seat big enough that I could crawl in there and take a nap. Now on the other end of the spectrum was a 2006 Corvette. This car is the best of both worlds. A great looking show car, but the driver Larry Holt races it also. The Silver State Classic Challenge is a timed open road race for 90 miles in Nevada. In 2017 Larry averaged 124.996 mph with the highest speed up to 165 mph. 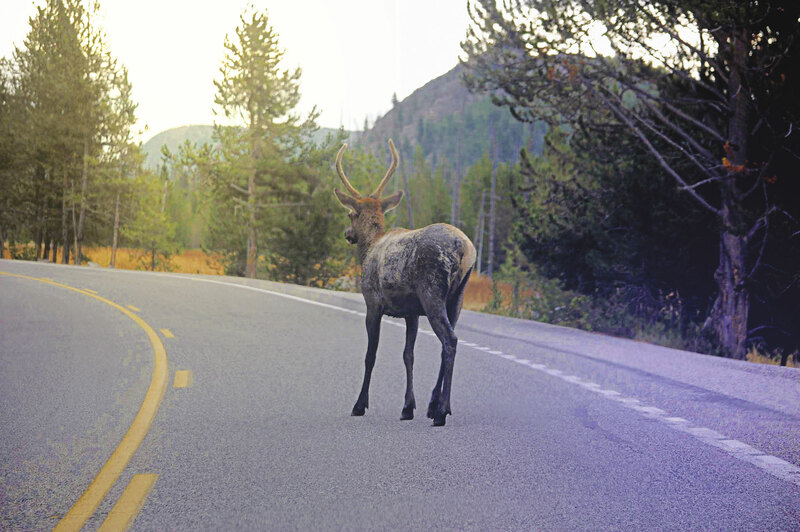 I asked Larry, “What it was like out on the open road?” One of the things he said was, “don’t forget to breath.” I’m breathless just thinking about it. With three WWII airplanes flying overhead in the clear sky and knowing that we are helping our veterans, it was a great day. They say you can never go home again. That is not always true. You can go home, only things have changed. 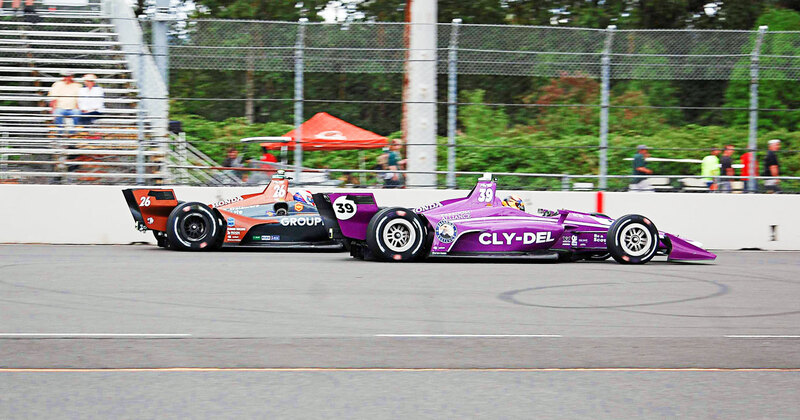 Home for me is Portland International Raceway. For 23 years I was involved with the Indy Car races at PIR. In 1984 I volunteered as a technical inspector. My job was to help weigh and measure the race cars. Another part of the job was to keep track of the pop off valves for the turbochargers of the car I was assigned to. As an observer I had the privilege of going just about anywhere. This included the paddock area, the pit box and even the race team tent and trailers. During the race I was in the pit box, off to one side, out of everybody’s way, observing the pit crew in action. During the pit stops, I would be checking the number of crew over the wall, number of tires that were being changed, fuel and several other things, for instance if the race car runs over the air hoses. I had a great time over 23 years meeting crew members and owners and drivers. The only thing I regret is the rule I was not allowed to have a camera, so no photos. Fast forward to 2018. I am at home again at PIR this time with a camera. I am here as reporter and photographer for Roddin’ and Racin’ NW Newspaper. As a photographer, I had just about the same privileges as before. I could not go into the race teams trailer and tent area without permission from the team. That also goes for the pit box. However, I could go anywhere else. The main rule was not to take any photos of the race cars if certain body parts were off the car, unless you get permission from the team. My plan was to do a follow up story about Alexander Rossi, the NAPA driver. I did a story earlier this year when Alexander visited the World of Speed Museum in Wilsonville. Alexander was, of course, much busier preparing for the race than he was at the museum. So I concentrated on his pit crew. It was great watching these guys in action. Just like true athletes they would stretch and limber up before pit stop practice and before the race. I asked nicely and got permission to be in the pit box. Here I am 11 years later, standing in the corner of the pit box at the pit wall. It felt great, just like old times. As I stood there I watched them remove a coil over shock, take it apart and change the spring in less than a minute. Amazing! During the times of hot pit practice, Alexander would bring the car in at full pit speed, just like during a race. The pit crew jumped over the wall, changed 4 tires, got a full tank of fuel and then off he would go. It was like watching a ballet, the smooth fast motion, every crew member on their toes doing their jobs precisely. As Alexander took off out of the pits, it reminded me of how Little Al would leave the pits in a cloud of tire smoke. In the time leading up to Sunday’s race I have never seen such a large crowd in the paddock area. It was very much a family event. Parents and their children were looking at the race cars and talking to crews and drivers. I even saw one of the drivers kneeling down to talk to a little guy on his level, face to face, and autograph the hero card. It was great. While going through the paddock area I talked to one crew member about the body part that covered the front shocks. The cover was made of carbon fiber and the vinyl decal weighed just as little as the body part, they are that light. Sunday, I was invited to the NAPA hospitality chalet. I took photos of Napa guests with Alexander. As he was leaving, I had a moment to ask a few questions. 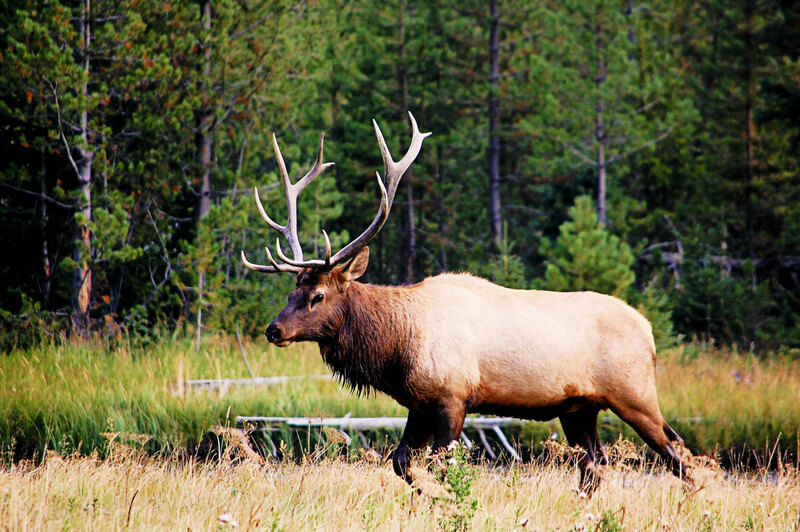 Simple questions, such as how do you like Oregon? Who is your favorite driver? Now that is two different ends of the spectrum: Nascar and Formula 1. As I watched the race from the chalet I thought you can go back home. The view from the chalet was great, but not as exciting as being in the pit box as the cars come in for a pit stop as I did 11 years ago. I want to thank the guys from NAPA and Alexanders pit crew for a great weekend. Alexander weekend was not so good. He finished eighth after leading the race. Yellow flags did not help him. Takuma Sato was the winner of the race this time. Oh yes, you can go home again, as long as you expect things to be different. It has been quite a few years since I have been to the historic races at PIR. So this year my friend Terry and I decided to go. We got there early in time to get a great parking spot, in the shade because it was going to get hot. I, myself, like to tour through the pits or paddock before the cars get on the track. The showcases of the day were vintage Formula 1 and Trans Am cars. Of the Formula 1 cars there were Brabham, Tyrrell, Shadow, Lotus, McLaren and several others. Also Trans Am cars such as Mustangs, Camaros, and Corvettes. These were more modern bodied cars not like the old ‘67, ‘68, ‘69 and ‘70 Mustangs and Camaros that I remember of the original Trans Am cars. Also racing were your typical selection of ‘60s and ‘70s sports cars. In different race groups there were Alfa Romeo, Porsche, BMW, Lotus, Jaguar, Volvo, Corvette, Camaro, Mustang, and a ‘65 VW Bug. Also formula cars such as Titan, Winkelmann, March, Swift, Lola and a gaggle of others were making great music on the track. I always go for the underdogs so it was great to see a ‘65 Bug on the track mixing it up with the sporty type car. By the way, if you did not know I am a proud owner of a 1965 VW Bug named Vincent Wendall. Also mixing it up with the V8 cars was a 1964 Studebaker Daytona. It was great to see it run with the Corvettes, Mustangs, a Porsche and a Ford Falcon. Actually, my most favorite car there was a 1970 McLaren Can Am car. Beautiful red, big block, staggered velocity stacks, big tires and the deepest rumble sound. 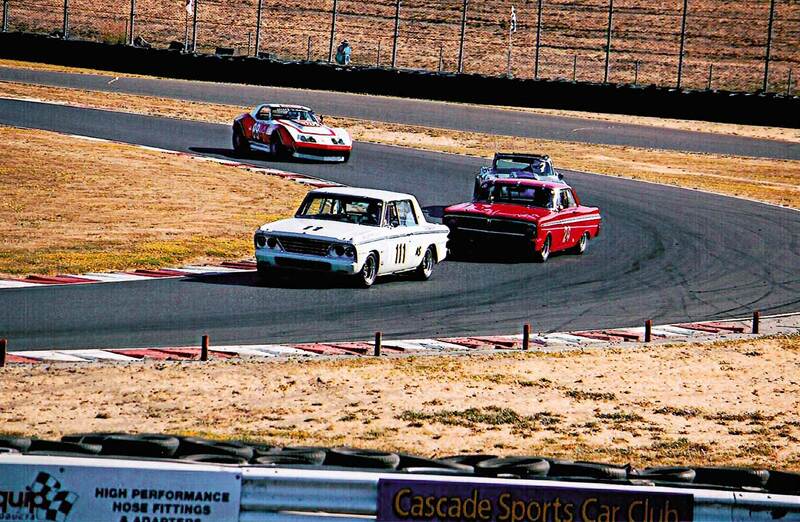 The modern Trans Ams were smooth and fast until Greg Pickett looped his Mustang in turn 9. Now I know your going to say turn 9? I am old school in the old configuration of pir and it was turn 9 then. Now it’s turn 12. You know, the big sweeping right hand turn coming on to the front straight. Geoff Brabham was the grand marshal of the festival driving a ‘72 Titan FF MK6B. I thought the most unique named car is the “Pooper” a 1953 Porsche powered Cooper. This was like one that Roger Penske drove back in the day. The weather was clear, the sun was hot and the racing was great. A great day overall even if it did take me three and a half hours to get home when it should have taken an hour and a quarter. Portland traffic!